Welcome to Caixa Futebol Campus, the highly-proclaimed academy of S.L. 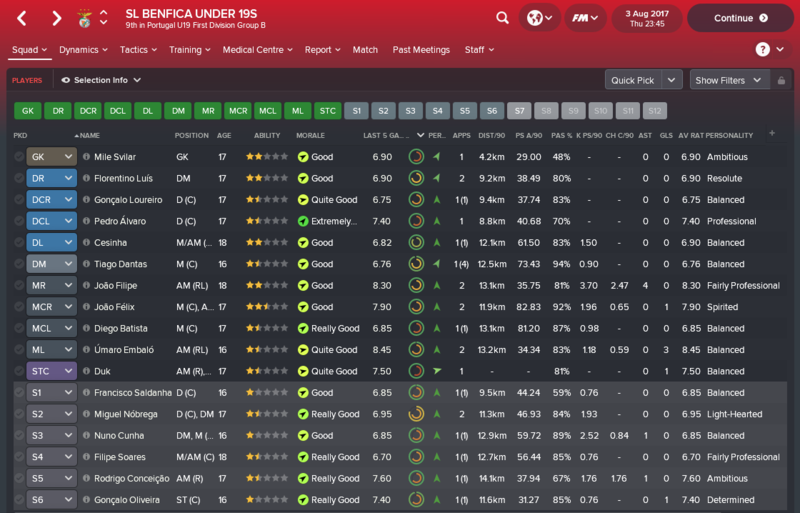 Benfica boasting state of the art facilities and an abundance of talented young players in Football Manager 2018. The objective of this thread is to discuss youth development, with an emphasis on instilling an dynamic & adaptable style of play that progresses as the team develops. 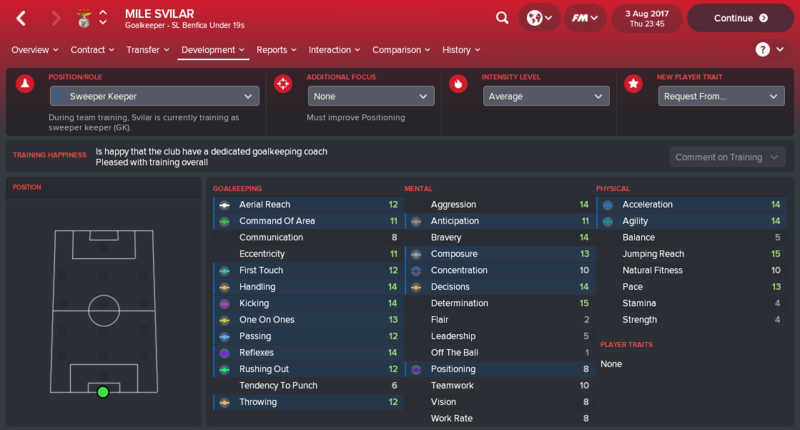 Disclaimer: the topic of Youth Development in Football Manager has been well documented over a number of years, the purpose of this thread is more application in relation to developing a tactical approach. 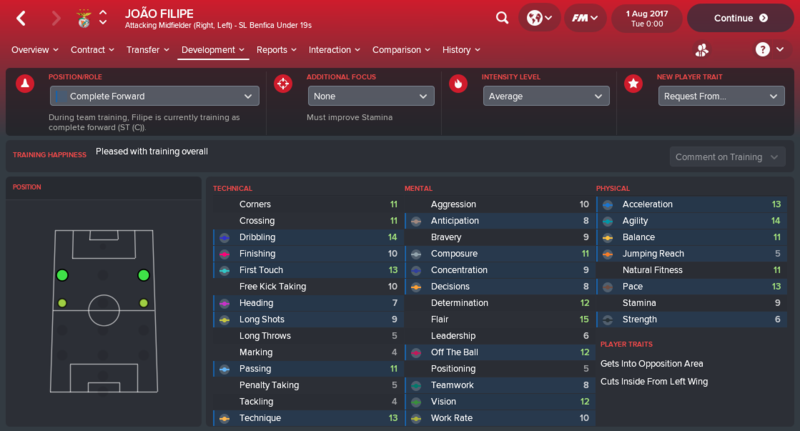 Youth Development in Football Manager 2018 can be broken down into the following aspects. External to the club, national Youth Rating and - of course - luck will play a hugely influential role. An advantage of developing players from a young age is tactical flexibility - training attributes, traits and new positions to suit a dynamic style of play. Possession football - bread & butter for a number of years now - will still play an important part. In order to function effectively in a variety of systems, players need to develop a high degree of collective football intelligence across the team. These attributes - combined with a technical skill and a certain degree of athleticism - will form the foundation of our training methodology. 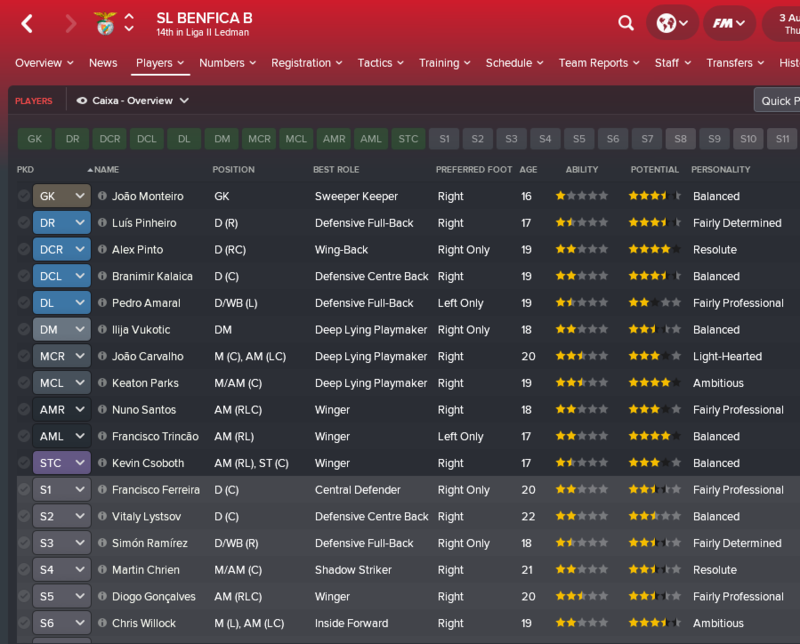 A primary reason for managing Benfica is the outstanding array of talented youngsters already at the club. Our inaugural match-day squad for the Supertaça Cândido de Oliveira is an early opportunity to introduce fans to a new generation of youngsters bursting with potential. The majority of the squad have come through the Caixa academy. Let's have a look at some of these players in a little more detail. Joins as a ready-made first team goalkeeper. Model Professional personality perfect to tutor Mile Svilar setting up an interesting future battle for the 'Number 1' jersey. Solid core goalkeeping attributes with reasonable football intelligence and technical ability. Talented, technical and creative midfielder. Injured at the start of the game, likely to compete for a deep midfield playmaker role when he returns. Deja vu, 3 in a row. Responsible for supplementing our squad - particularly with in those problem areas of striker and left-sided centre back - will be our scouting team. 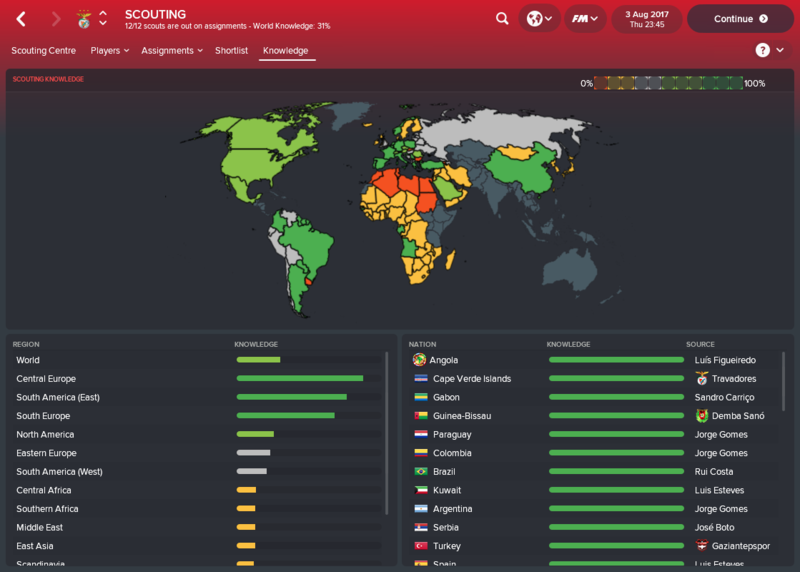 Continuing the theme of being a very well run football club, Benfica boasts a strong scouting network covering Europe, North and South America. All of which searching for players under 23, 4-stars or higher in Potential Ability. Current Ability increases are driven by a 'magic triangle' of factors within our control. This - to me - is essentially the Football Manager application of Sir Alex Ferguson's point on building a football club, as opposed to a football team. Years ago @SFraser - rest in peace - wrote an inspirational piece about structuring a football club to facilitate youth development. Benfica football club consists of 3 teams, competing in various competitions. The key is to ensure players are getting enough game time, at an appropriate level for their Ability. Rulli, Cervi, Zivkovic and - likely, when he returns from injury - Krovinovic will play first team roles. Personality - specifically Professionalism & Ambition - and Determination (source) improve training performance which accelerates Current Ability development. Professionalism is hidden but there are a number of personalities that indicate a high degree of professionalism. Young players can improve their personality through Tutoring from an experienced player - ideally, with high determination and a personality indicating high professionalism. "..I'd like you to tutor <young player> as I feel you can help improve his game"
"..I think it would be beneficial is you were to take <young player> under your wing and mentor him off the pitch"
Players must meet a number of criteria in order for tutoring to take place. Neither Tutor or Tutee can be injured or learning a trait and both must have 6-months+ on their contracts. Potential tutors with top-tier personalities - Model Citizen, Model Professional, Professional, Perfectionist, etc - should be tutoring as much as possible. Older players can often be excellent tutors and are often available for low transfer fees or even free so - particularly during the first few seasons - it's useful to bring in some extra tutors to bolster your capacity to develop young players. Remaining tutors are assigned to high-potential youngsters from the U-19s. Another primary reason for choosing Benfica is the excellent facilities & staff already in place at the club. 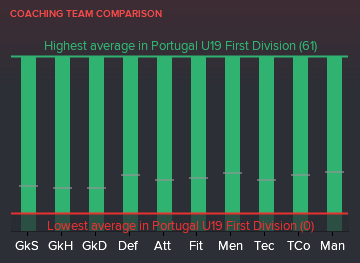 First team coaching is the best in Portugal. Massive kudos to those who spend years building academies in the likes of Romania, San Marino, and Gibraltar. As usual, I play on 'easy mode'..
As Current Ability increases, players' Attributes improve. Team & Individual Training influence which attributes improve the most. Time spent on Team Cohesion and/or Match Preparation means less time spent training Attributes, and vice-versa. Team Training - factoring intensity & rest - and Individual Training - factoring intensity & additional focus - combine to give an Overall Training Workload. Higher training workload means faster progression, but also higher injury risk. In individual training allows us to mitigate weaknesses and to focus on core attributes required to function effectively in a variety of systems. Goalkeepers typically train as Sweeper Keepers. Central Defenders develop their core defensive attributes and ball playing ability as Ball Playing Defenders. 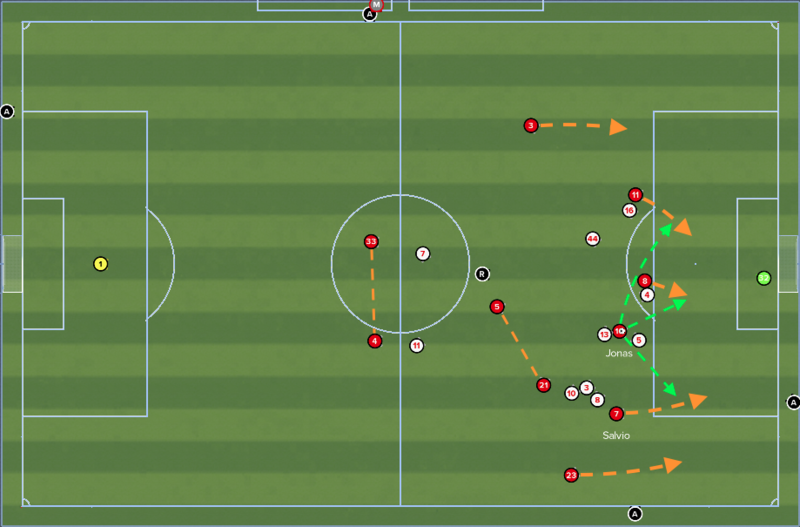 The fullback role is known as one of the most demanding in the modern game, and train as Complete Wingbacks. At this stage most Midfield players are going to be taking on the Roaming Playmaker role. In attack, we need to develop players with all-round attacking skill - and also I have lots of good attackers but few actual strikers - so I am training Attackers at Complete Forwards. Now we give this time to develop and re-evaluate accordingly. I'd also like to thank @Anaconda Vice for the Emilio Sansolini kits. Edited July 21, 2018 by Ö-zil to the Arsenal! Having sold the likes of Gonçalo Guedes to Paris Saint-Germain, Ederson to Manchester City, Victor Lindelof to Manchester United and Nelson Semedo to Barcelona for more than £130m in transfer fees in 2017, the start of the 2017/2018 season is the dawn of a new era for Benfica. The squad has a few key players which we will build the team around. 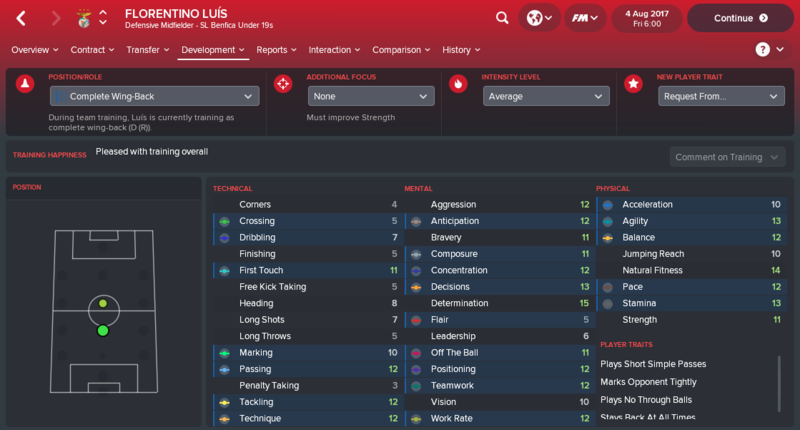 Luisão starts as Club Captain and has made 300+ appearances for Benfica but - at 36-years old and with his legs deteriorating - he'll be used sparingly. Aggressive, brave, intelligent, strong in the air and on the ground Jardel is a excellent classic central defender. Taking over club captaincy from Luisão as the rock at the heart of our defence. Positionally intelligent and excellent reader of the game, combined with aggression, bravery and strength. 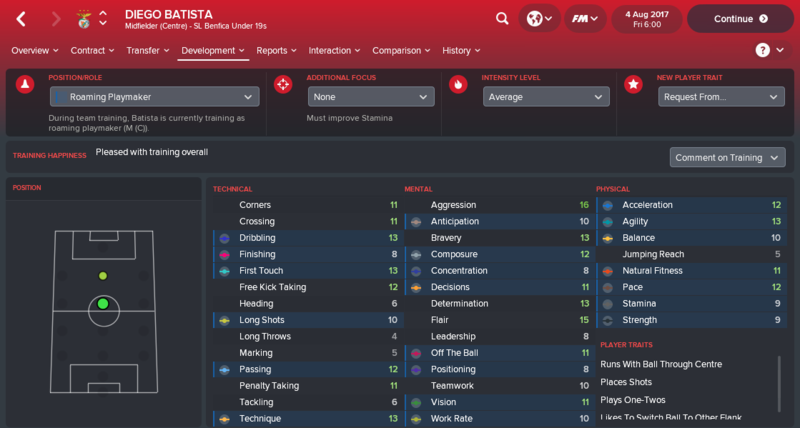 Fejsa is a superb midfield destroyer. Jonas is technically excellent in front of goal, intelligent and creative and - at 33-years old - offers an interesting dynamic tactically. In typical league matches - we are favourites to win the majority of games - our go-to set up is a simple, Structured 4-2-3-1. Designed to blend youth with experience and combine a solid defensive platform with pace, movement and clinical finishing. @fmFutbolManager's superb Mentality & Team Shape Calculator gives some insight into the way the system works. Standard mentality gives me a medium defensive block and a very balanced approach overall. Higher closing down and direct passing increases the intensity. Structured team shape reduces Creative Freedom & players prioritise their individual duties & position ahead of the team mentality. In comparison with Flexible or Fluid shapes, defensive players become more defensive and attacking players become more attacking. This benefits the high number of specialist players in the squad. 4-2-3-1 suits this style well. Defensive players being more defensive and attacking players being more attacking means that Duties have to be distributed carefully, to ensure the team is compact. In bigger games - particularly in Europe - we easily add some experience and drop deeper and focus more on the counter attack. Once again, referring to the Mentality & Team Shape Calculator we can x-ray the effects a Counter mentality has on the team on the whole. Supporting the change in Mentality we optimise the system with some additional tweaks. Our first challenge in the 2017/18 Champions League campaign is a home tie against Red Bull Leipzig - a intense pressing side, full of work rate and a fast attack on the break. RB Leipzig set up an an aggressive 4-4-2 - or even 4-2-4 - formation. We could perhaps have used a three-man defence - if we had trained it - to maintain an extra man advantage against the two centre forwards but decided not to rush a change. Instead we lined up in the Counter 4-4-1-1, aiming to defend deep and attack the space left behind the opposition defence quickly on the break. The two compact banks of four defend just ahead of our 18 yard box, aiming to force the opposition wide. Attacking Midfielder (Support) does a great job disrupting opposition play ahead of our double-pivot, allowing them to hold their shape. When the opposition go wide they are then swarmed by the more aggressive players on the flank. Attacking Midfielder (Support) - again - fantastic in coming all the way across to trap the opposition player. Central defenders and double pivot maintain a strong defensive position. After winning possession the counter-attack charges at the disorganised opposition defence. 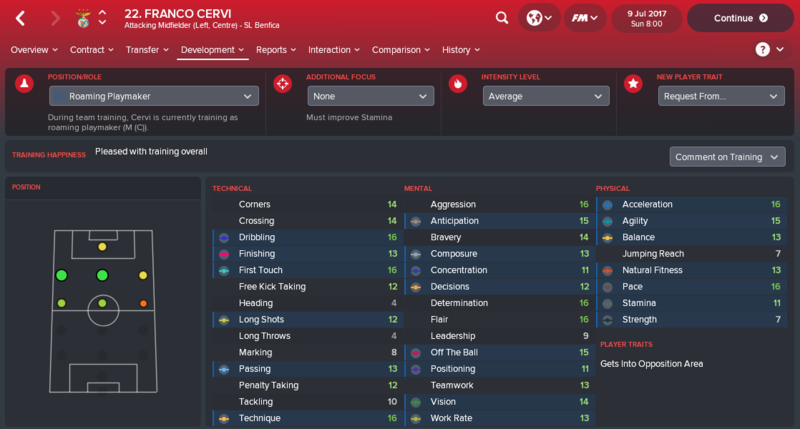 Cervi - man of the moment - surges forward in acres of space. Jonas - who'd stayed forward throughout the defensive phase - now occupies opposition defenders and runs into even more space in behind. Zivkovic & Salvo - at this stage - support the attack, charging towards the box. 1-0. Cervi stays wide, reaching the opposition 18-yard box drawing the central defender and then cuts back for unmarked Jonas to tap in. In the attacking phase Deep-lying Forward (Attack), regularly - as the name may suggest - drops a bit deeper in the attack. Attacking midfield trio are all now Roaming from Position and Getting Forward. Wingers have moved inside and Wingbacks are Overlapping, providing width. As well as a goalscorer, Jonas is also a superb creator and has multiple options to directly create a goalscoring opportunity. In this instance he actually takes the most difficult option, cutting inside and finding Zivkovic coming in from the left wing. 2-0. We have already discussed my long-term objective - to control games with positive, free-flowing possession football. In order to achieve this I need intelligent, technical, athletic & versatile players. As things stand, our players are far from fully developed. In this post we discuss adapting our tactics to our team at their current level of ability. This match day squad is a selection of high-potential young players - including U-19s, B Team and First Team players - earmarked to be given opportunity in cup games and identified as the potential future of the club. We still have two gaps - left-sided Centre Back & Striker - currently filled with experienced players balancing the youth around them. Technical ability is already pretty strong, across the team. The clear weakness is football intelligence, particularly in midfield. Off the ball movement isn't great. Team and individual training have been tailored to develop this over time, but until then it is important to make allowances in our approach. High technical ability suggests we can build up play from the back and play a possession game. Switch to Attacking Movement in Match Training may help counteract poor off the ball movement. Defensive structure must allow for potential lapses in concentration and/or suspect positioning in midfield. Players do not yet have the decision making capacity to be given a high creative freedom. Control team mentality suits an expansive - yet balanced - style of play. Given that players do not yet have strong decision making capacity it is perhaps unwise to give high creative freedom associated with more Fluid team shapes but - that said - I am also not inclined to reduce creative freedom and risk becoming predictable. Flexible team shape offers a balanced level of creative freedom. All players balance Team Mentality and their individual Duty. 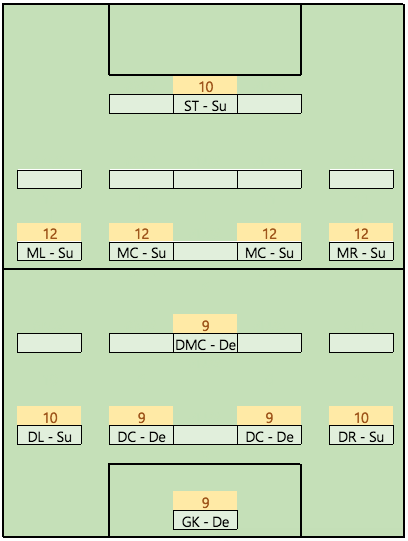 Players are sub-divided by position. Individual Mentalities in the Defence and Defensive Midfield strata are slightly lower than in the Midfield strata. DM(D) will have a lower individual mentality than a MC(D) and so on. The common concern here is that this sub-division creates a gap, reducing compactness. In the previous system we talked about a Stopper to close the gap between Central Defenders and the Central Midfielder (Defend) and Look for the Overlap to close a gap between the Wingbacks and Wingers. In this instance Exploit the Middle will increase the mentality of players with Defend duty in the Defence and Defensive midfield strata. This eliminates the gap between defence and midfield. This funnels possession through our best passers and most creative players in midfield. Combine this with Play Out of Defence, Retrain Possession, Pass Into Space and Close Down More and - voila - we have a playing style that fits our objective and the current skill level of our players. Formations are neutral; it is their application that gives them positive or negative qualities. Our formation is going to depend on a number of different aspects. Possession play demands a strong midfield presence. 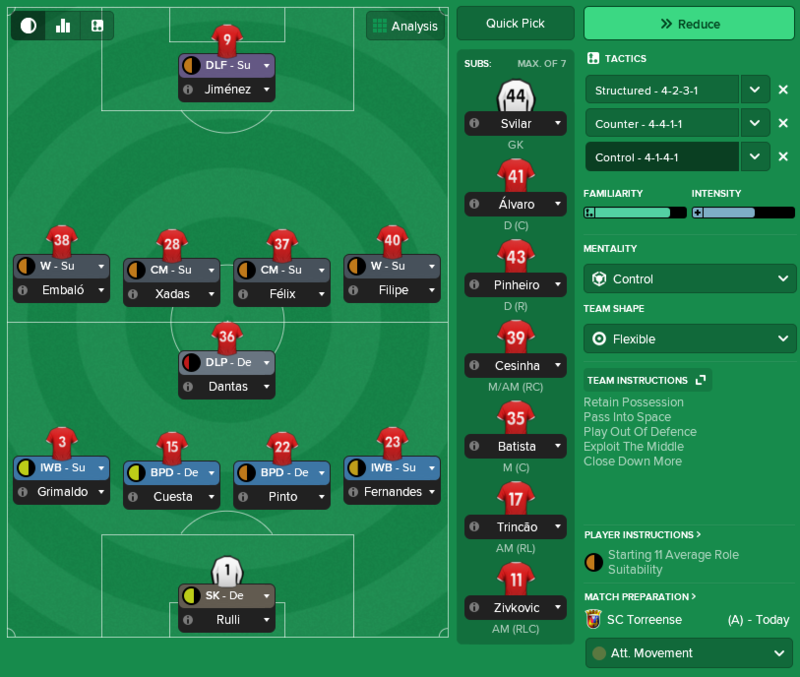 In the Grassroots Tactics thread, we discussed 3-5-2, a diamond and 4-3-3 for FC United in the Conference North, ultimately choosing 3-5-2 for it's suitability for our squad and facing many opponents playing 4-4-2. Following similar logic but this time considering we are primarily facing 4-2-3-1 or 4-3-3 variants and the quality of our wingers my start-point was a 4-3-3. Considering the need for a added defensive structure this became a 4-1-4-1. Apologies to those looking for liberos, registas or a ponta de lança - why on earth not.. - I prefer keep things simple. On the face of it, this looks conservative until you consider that playing without an Attack duty slightly increases the individual mentality of players on a Support duty in midfield or defence. 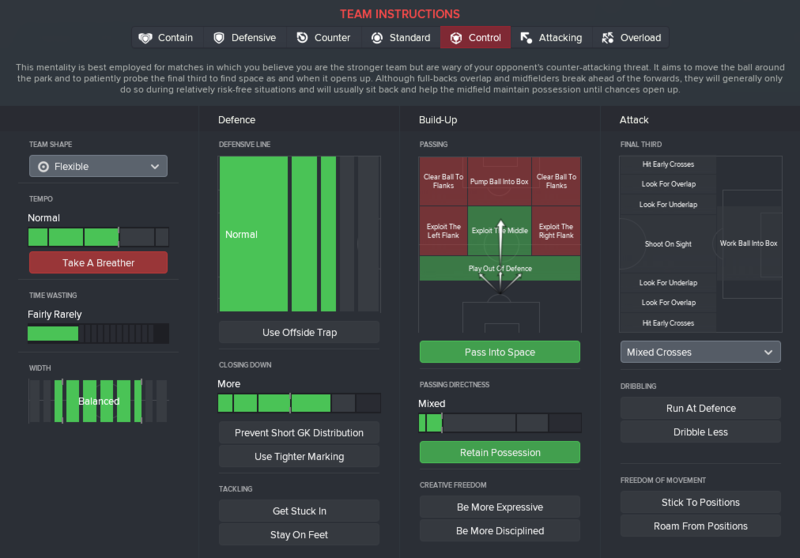 Let's use @fmFutbolManager's Mentality Calculator to take another look under the hood. Individual mentalities across the squad are positive, yet balanced. Exploit the Middle is increasing individual mentalities of the Centre Defender (Defend) and Deep-Lying Playmaker (Defend) bringing them closer to the midfield. No Attack duty slightly increases the individual mentality of the entire midfield and the wingbacks. Our entire midfield has an individual mentality exactly half way between a Support and an Attack duty in a Standard mentality. An Attack duty would increase the mentality of the individual. At the expense of a slight decrease for each of the other players - in this case 6 players - in the Support unit. In this system we attack as a unit rather than rely on an individual. Remaining player instructions are very minimal. In the first season, this style of play will be introduced slowly in cup matches and - perhaps - league matches towards the end of the season. Our first run out was the Taça de Portugal Placard 3rd round against lower league SC Torreense - a perfect opportunity to experiment. Perhaps our defensive structure wasn't tested as much as it could have been, but there were no signs for concern. We regularly pressed higher up and into the opposition half, retaining our shape well. Over recent years the addition of new roles and improvements in the match engine mean we can create more dynamic tactics than ever before. In this system we attack in a 2-3-4-1. Inverted Wingbacks push up and in, sitting alongside the Deep-lying Playmaker. Midfield pushes forward as a unit. Deep-lying Forward drops deep to link play. The team is structured to offer our Playmaker lots of passing options. The deep-lying playmaker is the only playmaker in the side so likely to see a lot of the ball. Exploit the Middle also routes play through him. In possession he is flanked by Inverted Wingbacks and has Central Midfielders ahead of him. The opposition pressed quite well, but the Centre Backs act as a pressure valve and can easily bypass the press. The Data Analyst report also shows the advantage of a positive mentality - playing forwards and progressing the ball. Edited July 24, 2018 by Ö-zil to the Arsenal! One season in and the objective remains evolution rather than revolution. Success in the first season - winning the Primeria Liga and the semi-final of the Champions League - means Europe's top clubs are coming for many of our players. Manchester United bid £8.25m for last season's top goalscorer - and 34-year old - Jonas. 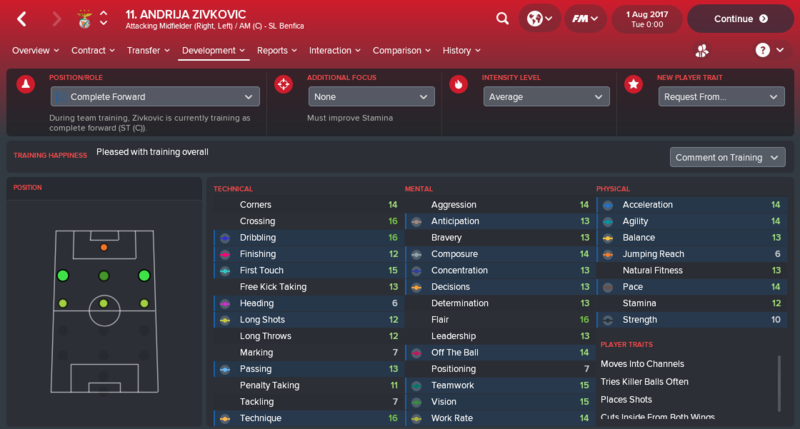 Bayern met the £53m release clause to sign Zivkovic. Monaco came in with £21m for Salvio. Pizzi and Rafa left for West Ham for £11.25m and Burnley for £10.25m respectively in search of first team football. Meanwhile the academy players in out U-19 team won the UEFA Youth League and have earned the opportunity to progress. Rúben Días played superbly last season, quickly establishing himself ahead of Luisão and developing into a strong, aggressive and intelligent defender likely to become club captain this season. 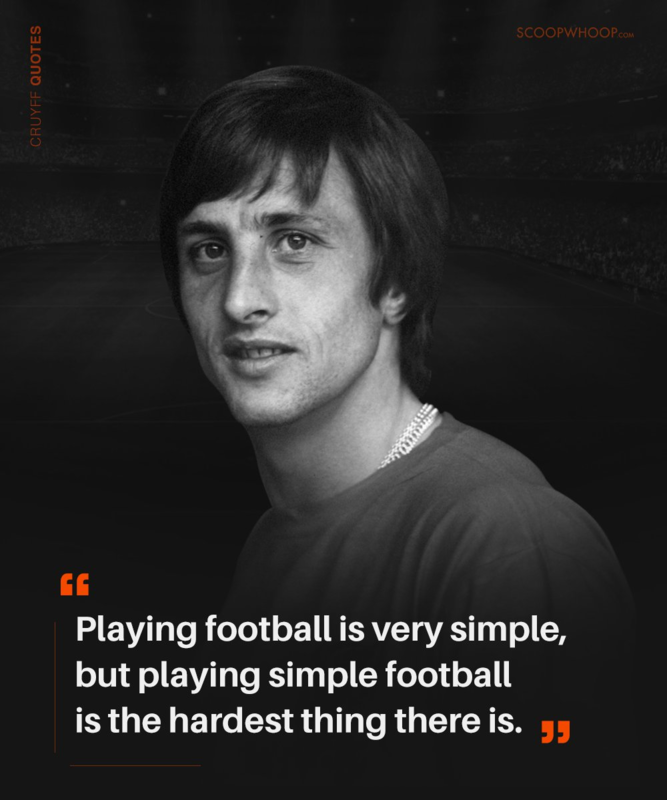 Training as a Ball Playing Defender did not have the desired effect on his technical ability so added an individual focus and learning to play simple passes. 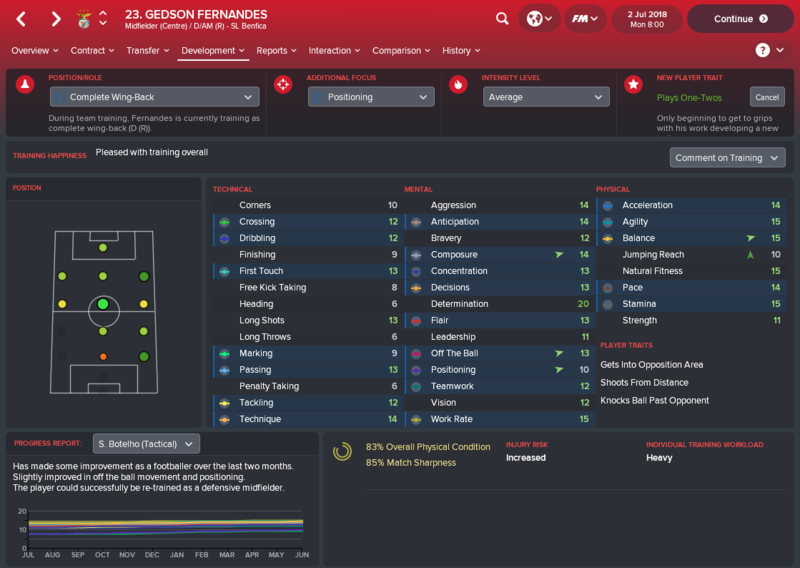 Gedson Fernandes settled into the team on the right side of defence quickly and never looked back. He developed well throughout the season and is now focusing on improving Positioning and learning to play one-twos. Alex Grimaldo looks close to his potential on the left and has been excellent as a traditional wingback and in the inverted role. Xadas played a rotation role last season and the game time caused him to develop into an intelligent, creative midfielder. Having been successfully tutored he is now working on his Tackling and earning to play one-twos. 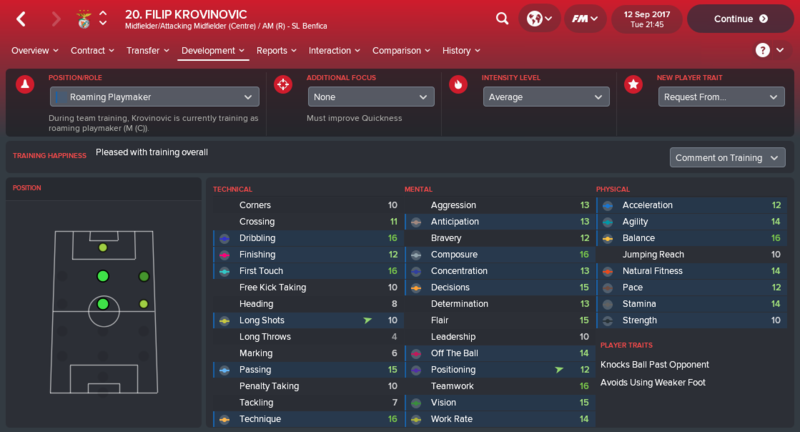 Krovinovic displaced Pizzi in the team quickly after returning from injury but came very close to leaving due to a contractual dispute before being persuaded to stay. 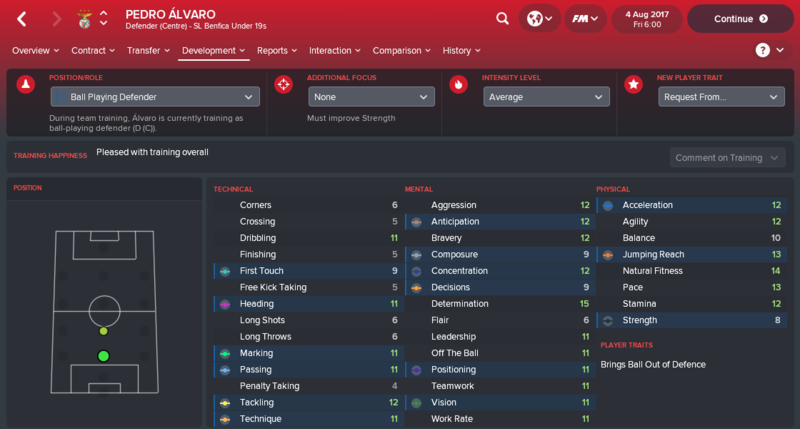 Tutoring from Pizzi developed some great traits for a dynamic midfield player. Alongside Xadas and Fejsa we have the potential for a very strong and well-rounded midfield trio. Cervi did make noises about a move but didn't quite do enough to attract the attention of the major clubs. 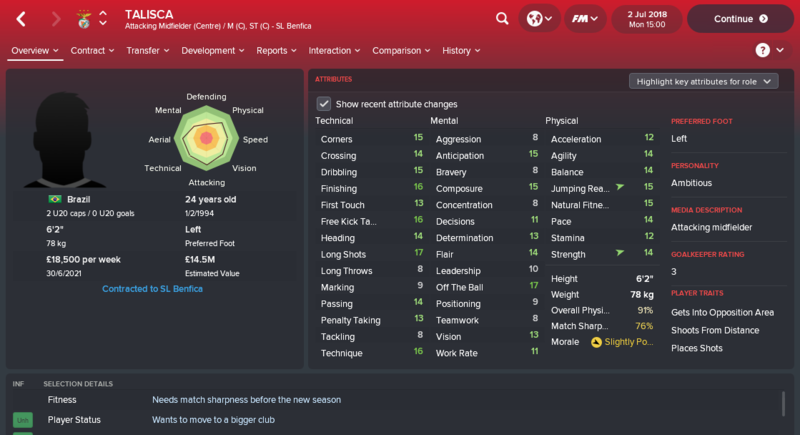 Tutoring from Jonas developed some interesting traits for a dynamic attacking midfield role. Finally returning from loan is Talisca - a real goalscorer. Clearly a talented but disruptive character, asked for a move to a bigger club on his first day back! 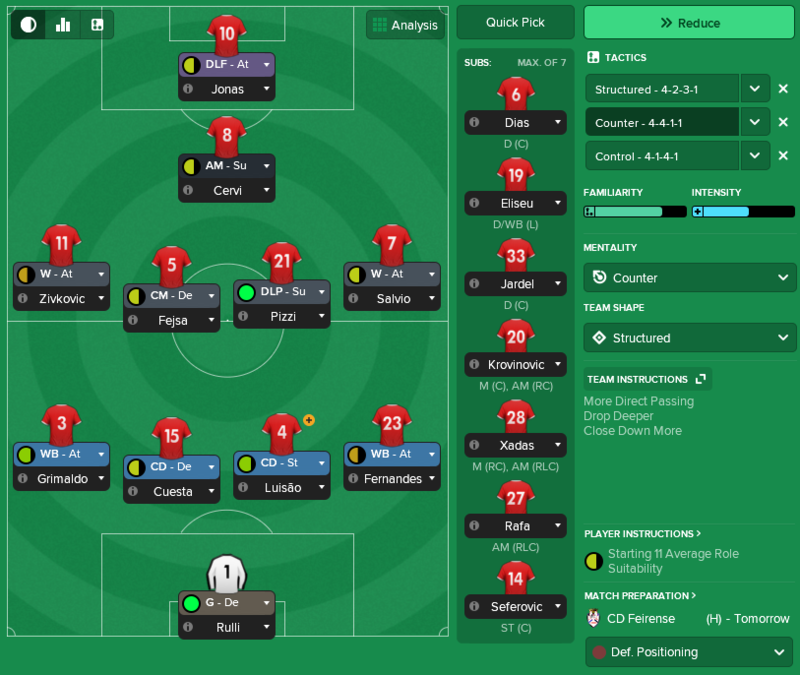 Looking at our existing squad - and before delving too much into the transfer market - we clearly suit a diamond 4-4-2. 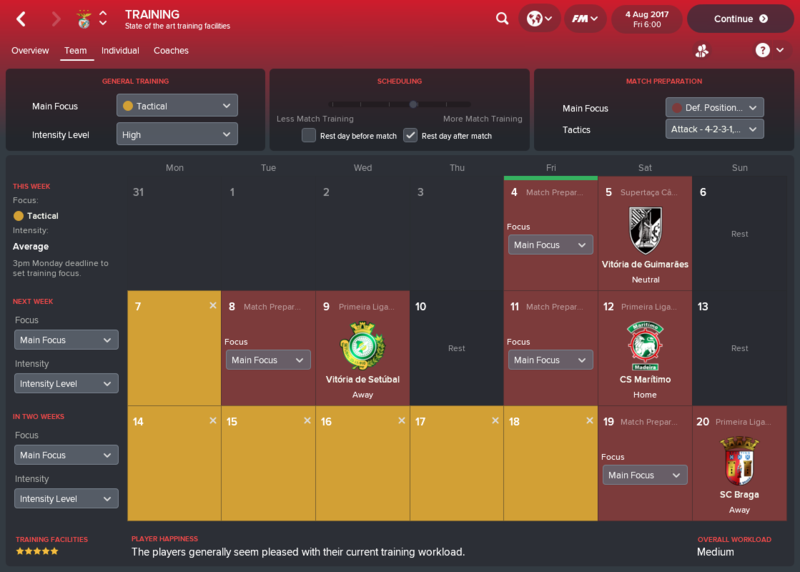 Time will tell how that looks after pre-season and seeing which transfers are available. João "Jota" Filipe recently set the real-life U-19 European Championships alight and was the star of our U-19s UEFA Youth League win. Not yet at a level to compete in the Champions League or to be relied upon in the first team but getting adequate game time will be a high priority. He's already tutored and now learning to play one-twos. 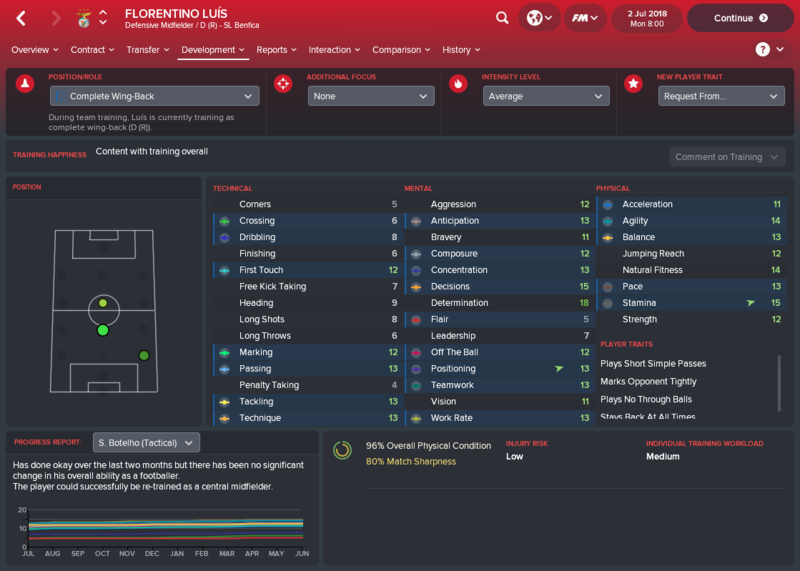 Florentino Luís is a versatile player, well rounded player capable of playing in midfield or as an inverted wingback. 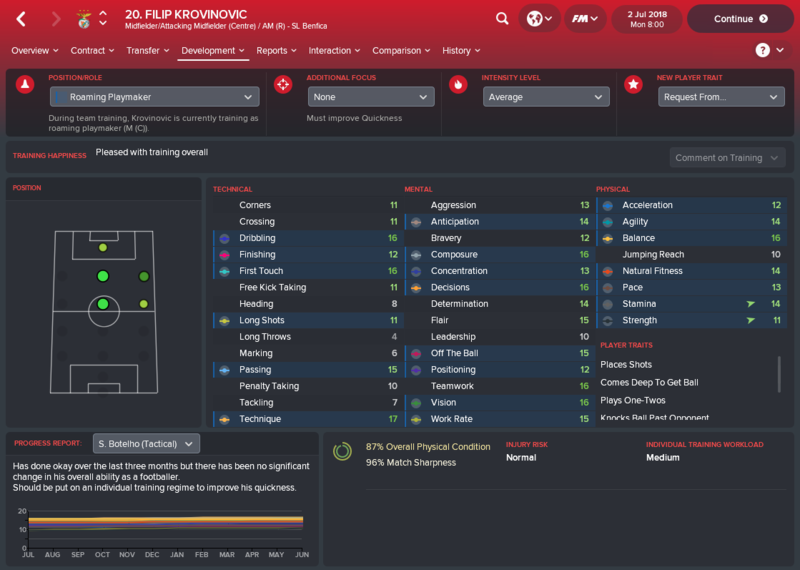 Tutoring from Ljubomir Fejsa last season developed some useful defensive traits - which will be useful in an inexperienced team - but perhaps no through balls is a step far and likely replaced by plays one-twos once finished with the final tutoring. João Felix developed reasonably well last season but perhaps not at the same rate as some of the others. On the other hand his performance levels were excellent so it is perhaps that he needs an opportunity at a higher level. Experimenting with giving game time from the bench and in league games and continuing to tutor. 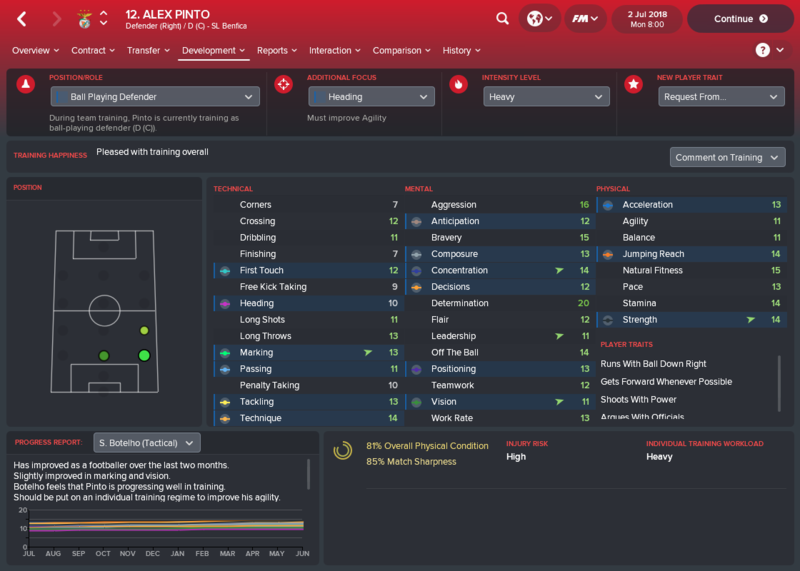 Alex Pinto is a young versatile defender, comfortable on the right or centrally. 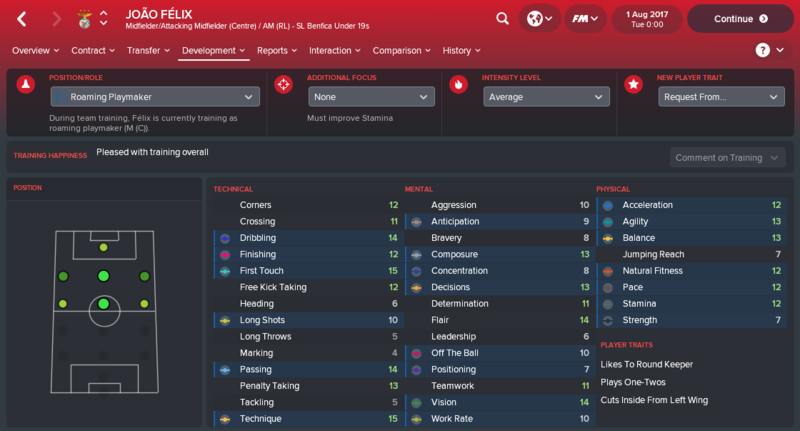 Currently being tutored by Axel Müller - Model Citizen - but urgently needs to remove some traits before being relied upon at Centre Back! 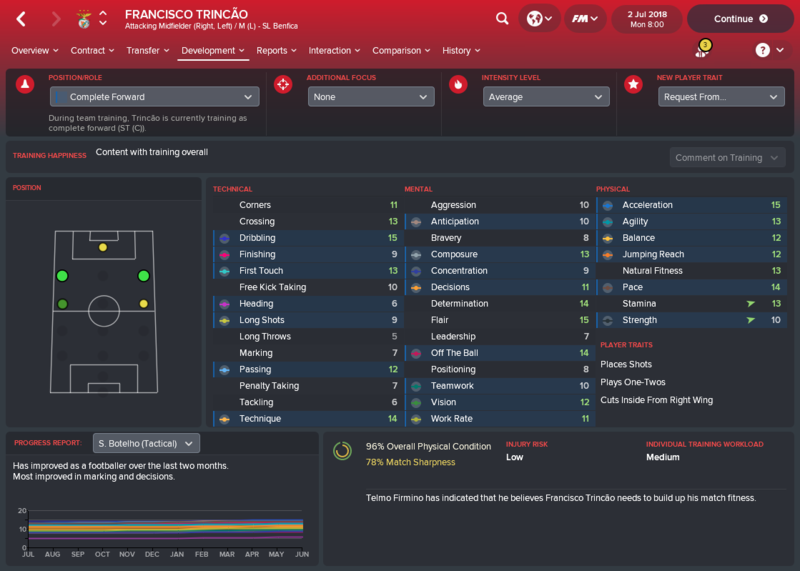 Francisco Trincão is promoted from the B Team as a talented left winger. Needs a bit more tutoring, and some game time. Finally - for the first team - a new face. 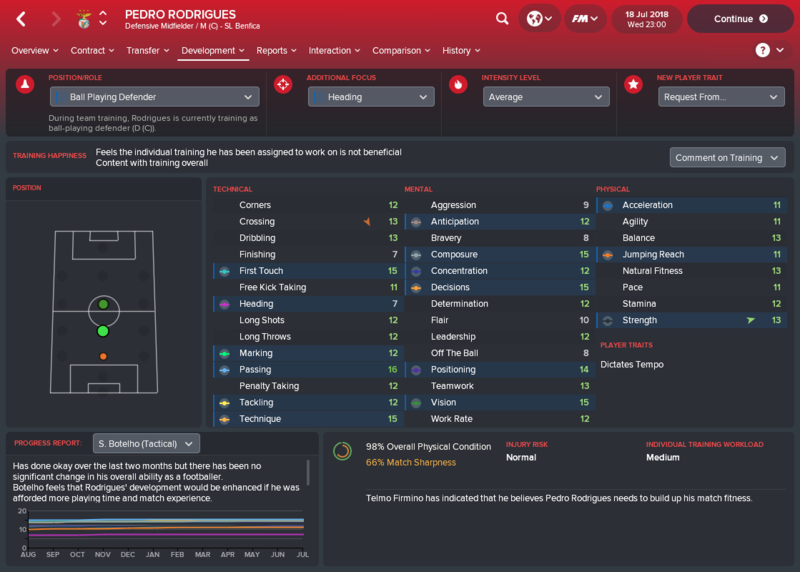 Pedro Rodrigues returns from loan and despite being rated as less talented than some of the others seems to have a very efficient distribution of attributes for our style with intelligent play and positioning. He'll be covering for Fejsa and potentially in a half-back role. Our B Team is an intermediary team between the U-19s and the First Team. Victor Bobsin is still retraining as Centre Back and would be behind Dias and Cuesta in the first team. Pedro Alvaro looks good but would be behind Jardel and Alex Pinto in the first team. Cesinha is retraining at Right Back and would be behind Gedson Fernandes and Florentino Luis. Diego Batista is also a good young midfielder and developing well but behind Krovinovic and Felix in the first team. I am not going to talk about newgens in this post - too many random factors for this discussion. Given that training has the biggest impact on development until the age of 18 and my U-19s train harder - due to less match preparation and fewer matches - I keep my two most talented under-18s here. 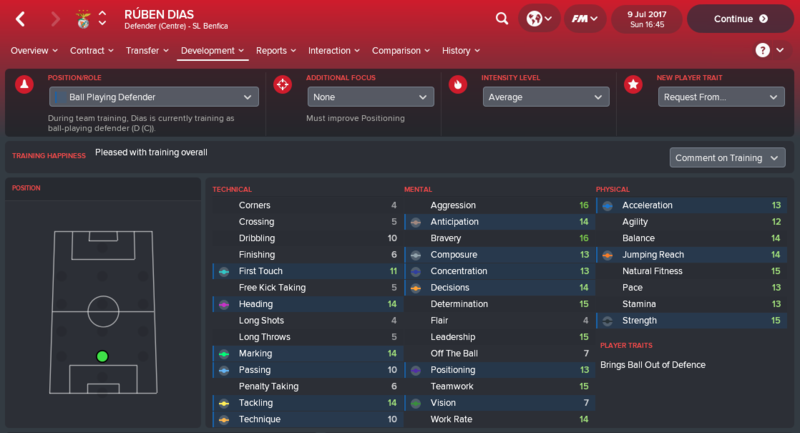 Dantas has developed well as an intelligent and technical midfielder as well as learning to play in Defensive Midfield, more of the same and we'll be looking at him for the first team next season. 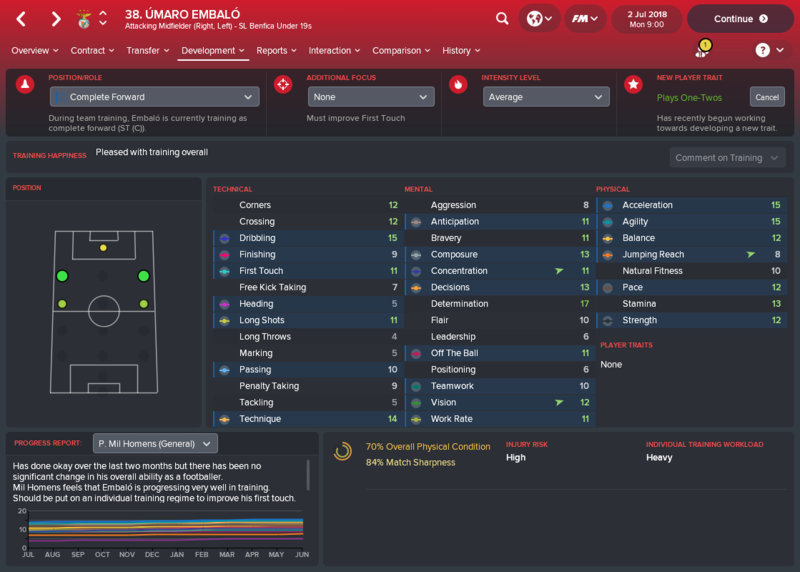 Embalo - similarly - has developed into a much more well rounded player. It'll be interesting to see how he continues to develop this season. That's about all for the Development Update. Enjoy & I'll update again shortly. Edited August 4, 2018 by Ö-zil to the Arsenal! Personality - specifically Professionalism - and Determination (source) improve training performance which accelerates Current Ability development. Professionalism, Determination and Ambition all play a roughly equal part in player development. It's mentioned by Seb Wassell further into that source thread you linked . Perhaps also worth mentioning that whilst game time at a suitable level is relevant for all players, below the age of 18 training takes precedence whereas from 18 and up matches take precedence. Interested to read further updates . Fantastic depth of analysis! Looking forward to more updates! Great stuff, Ozil. Nicely written and laid out (as usual!). Looking forward to seeing how you phase in possession play. This is superb. 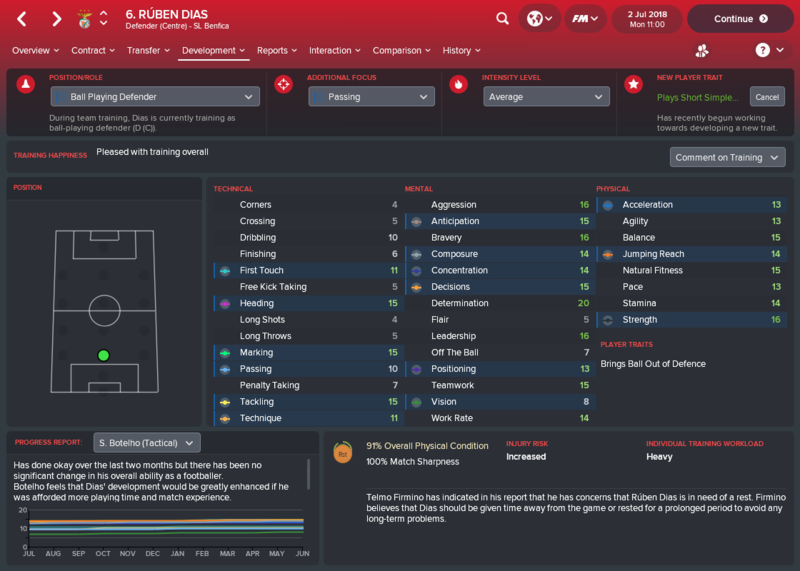 I'm really intrigued as to what you think about possession based approaches in this game. That elusive approach that appeases those of us whom want to dominate on the ball and at the same time create scoring chances. Amazing topic. Will follow along with a similar thing with Sporting Clube de Portugal! Gratz mate! Great lineup of youth there--but I didn't see Ze Gomes anywhere. 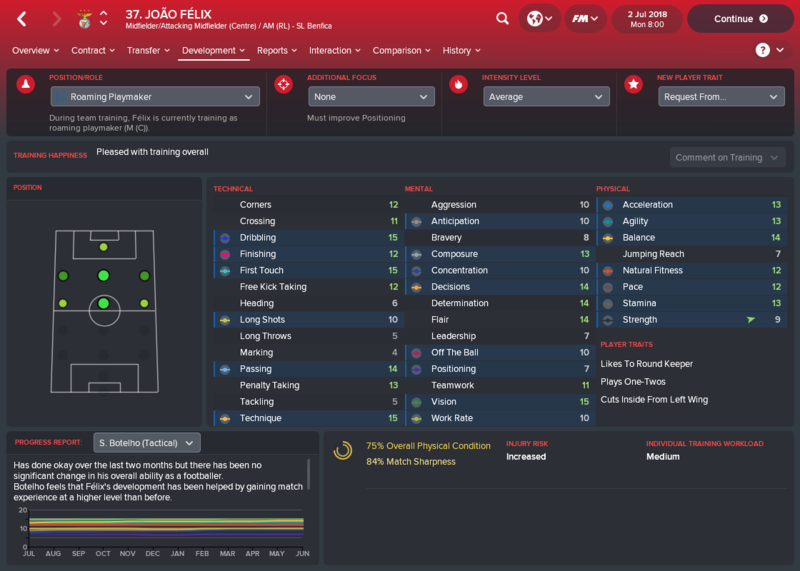 I don't have FM18 but on 17 he was a pretty well-rounded young striker with bags of potential, and I'm sure he was on Benfica's books. Have I just missed him somehow? You're right, Ze Gomes does look good. 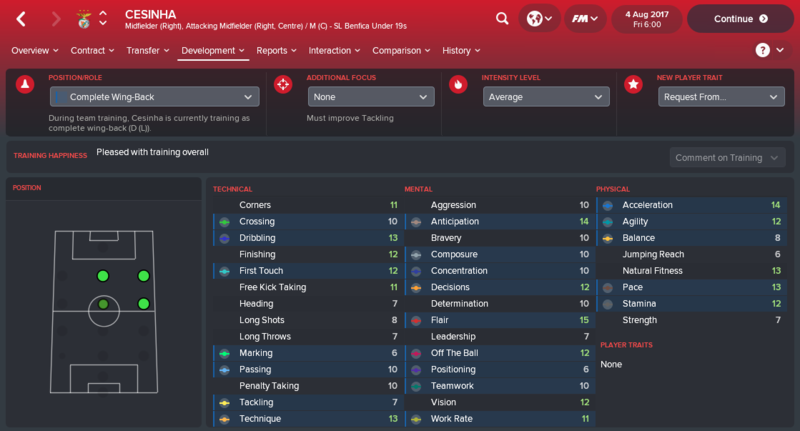 He's injured at the start, returning around October so I'll get him match fit in the B Team until the Christmas break and then see where I can fit him in. Might already need to start making a few sales to fit people in! There is immense talent in Portugal. 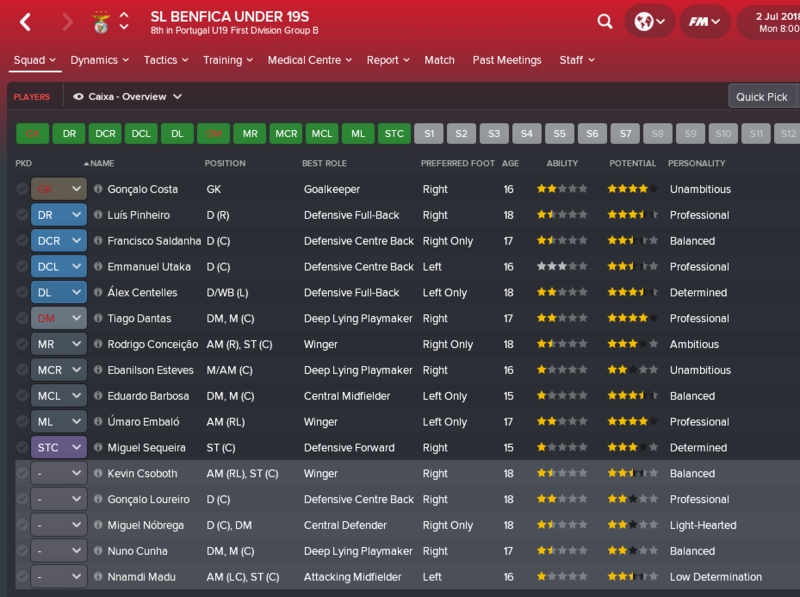 Benfica, Porto and Sporting have good young players. I wanted to do the same in my club, FC Porto. Have the "Class of Diogo's". Diogo Costa (GK); Diogo Dalot (RB), Diogo Queirós and Diogo Leite (CB's). Well, and Diogo Bessa (LB), but, but not so talented. 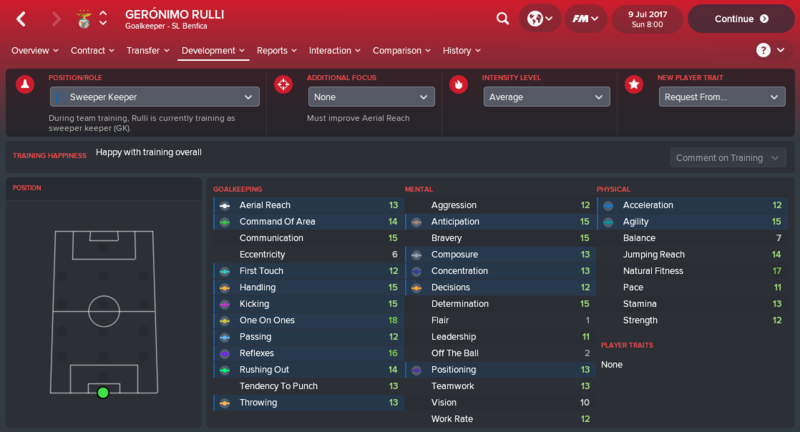 Have other players very interessed: Romário Baró, Afonso Sousa (one of the most talented), Rui Pedro (loan at Boavista in 1º season), Rui Pires (new Rúben Neves). Hey O-zil, would you have to set these up over and over or can you put them as on going assignments? 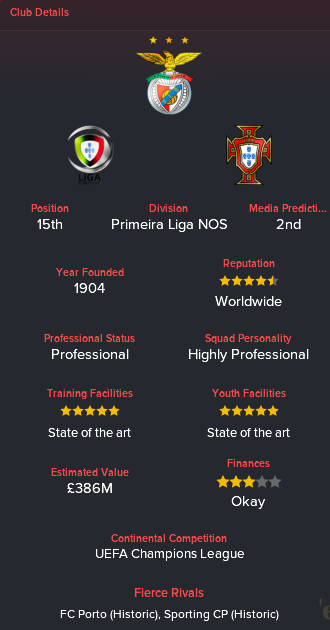 Portuguese sides have so much talent it's fantastic. During the season my Director of Football is responsible for Scouting Assignments so I can focus on the football. 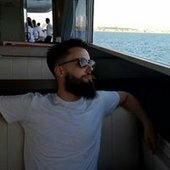 I will manually set the Data Analyst match reports - very useful! - and tweak the General Focus of scouting to Young players. This would be different if we needed more players but our squad is very complete. 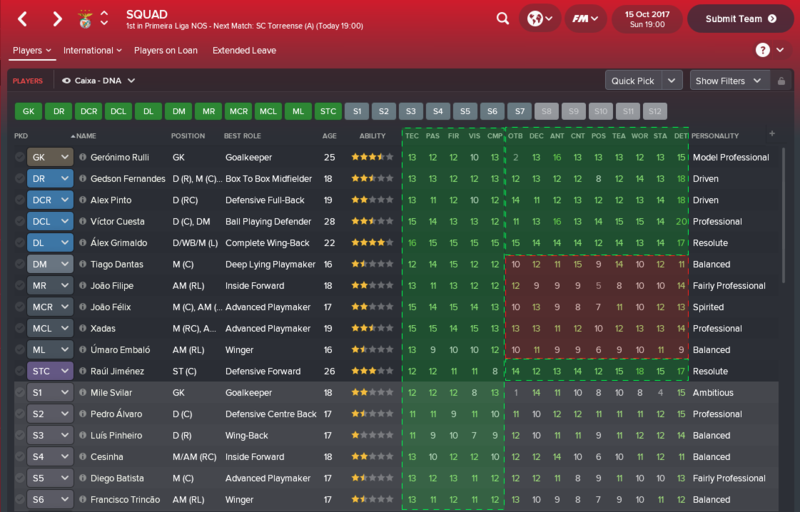 As mentioned - I have my eye out for a Striker and left-sided Central Defender but I am potentially able to solve these within the existing squad. Yes, is very good player. He in 2016/17 played in Porto, loaned by Atletico. Great thread again. Your stuff is amongst the best at explaining how the game works in simple, footballing terms. Great post once again. Just wondering if you change the Tactical Training Focus or do you keep it on tactical? Sorry for posting this but can you tell me what skin do you use? Nice work. Haven't learned this much from an OP in a long time! Reminds me of what I'm trying (and succeeding :D) to do in my Athletic save. Making a DNA from the ground up in order to build a winning team playing good soccer. Well done, @Ö-zil to the Arsenal! Hello @Ö-zil to the Arsenal!. I enjoy the way you set out all your topics. You always get your points across in a very user friendly manner. I think most people accept you can't throw players into their preferred roles + duties and somehow that'll make a coherent tactic. I too buy into that. However you mention adapting the tactic to the team in post#2, plus you should be a very dominant side domestically. Added to which you have chosen standard-structured (which conceivably lends itself to my question? ), so do you think you could get at least a couple more players maximising their talents in their best role/duty than you actually have? Currently only Pizzi is catered for 100% in that capacity. Could it be a simple 'no' because it won't work or a 'no' cause it's outside the DNA framework you want to impose? Just curious. 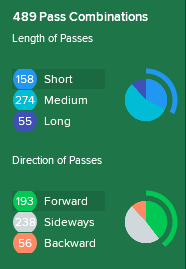 @Ö-zil to the Arsenal!, I generally use very similar roles for training (CF/IF for attackers, RPM for midfield), but I tend to use Libero rather than BPD for CB's as it covers more physical attributes (pace and stamina in particular) as well as dribbling, which seems useful for building out of the back. What's your rationale for BPD > Libero, assuming player is already natural at CB? @Pass and Move If I'm not mistaken learning a new position takes up PA, so I imagine given he has no intention to use a Libero / Sweeper he just wants to maximise his players' development for their main positions. If so, why train wingers with Complete Forward if they will never be played at CF? My impression was that learning a new position made the player's CA weight attributes differently, i.e. weigh certain attributes more highly than they would be otherwise -- meaning that a retrain to a more 'foreign' position would have a strong impact on CA but a like-to-like retrain (left wing to right wing) or a similar position retrain (CM to DM, CB to SW, RB to RWB, etc) would have a minimal impact. 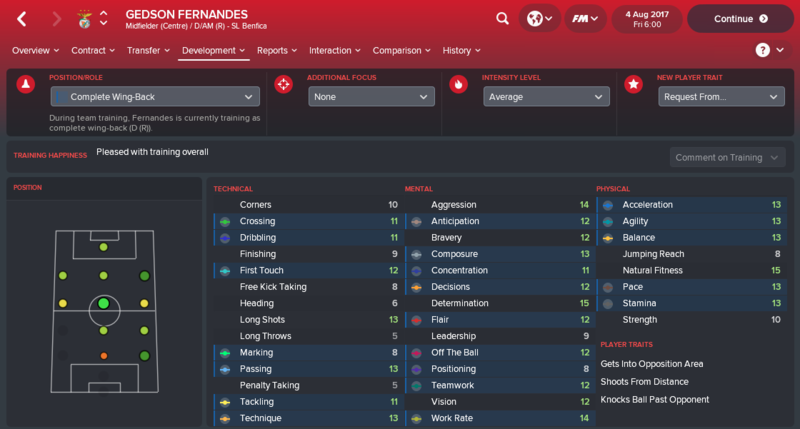 Cracked open the editor to look at this and changing a CB's sweeper rating from 1 to 15 brought his 'recommended current ability' (I have no idea what this means) up by 2 but did not change his CA. 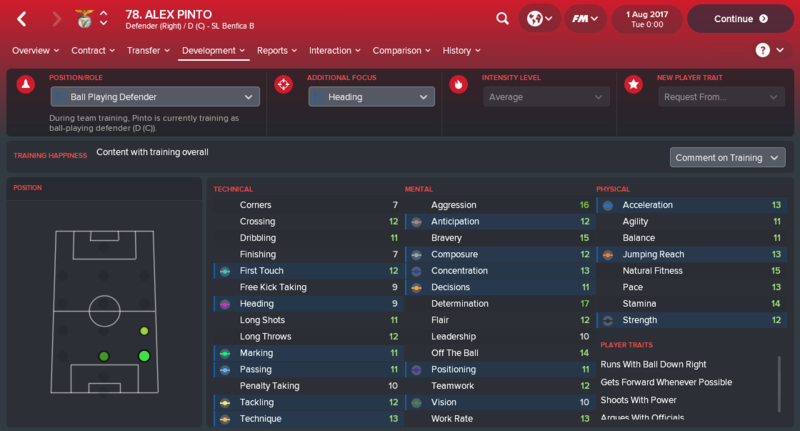 not sure if he is still the same on the new database as i started only this benfica save when buying the game and i'm still slow managing many months later, but have a look at a kid called diego batista in the u19s because he can turn into this (and has turned into this on fm17 as well so i think his potential might be fixed at something quite decent?). 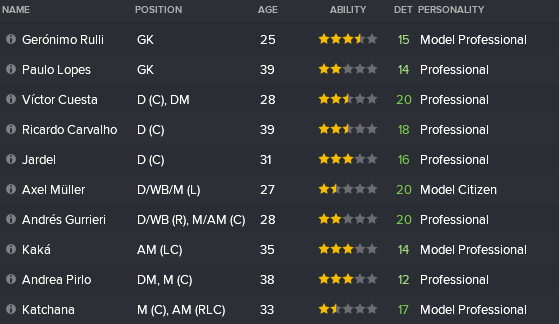 i am only a goalkeeper away (currently still mile svilar) of not only fielding a complete academy first eleven throughout all of the season but also being really competitive with it. 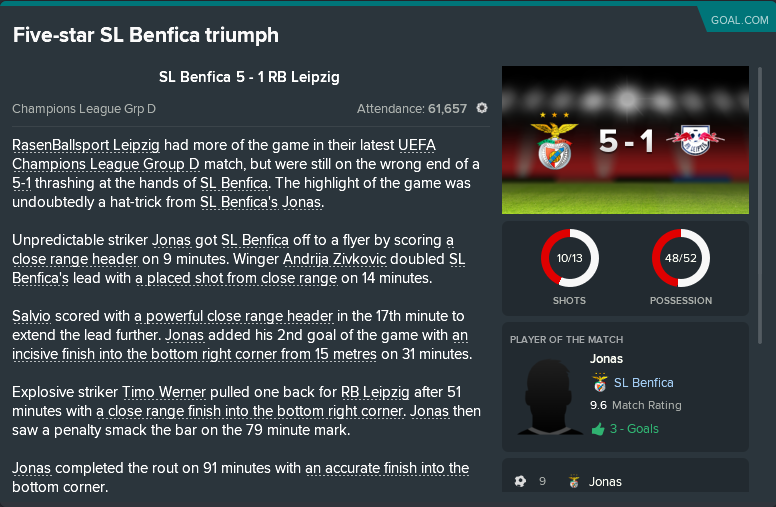 two champions league semi finals with a complete academy squad or ten academy players of the first eleven is pretty decent. wish a goalkeeper would come through. one has, but he's maxed out potentially i think at only 19 years old. 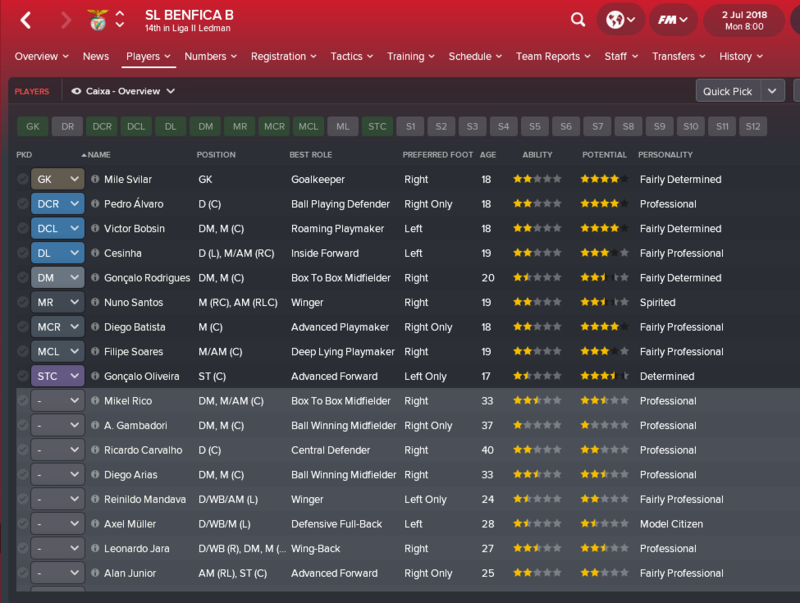 i signed back renato sanches and goncalo guedes from bayern and psg because i had so much money in the bank from selling non academy players that i could easily drop 70 million on each. 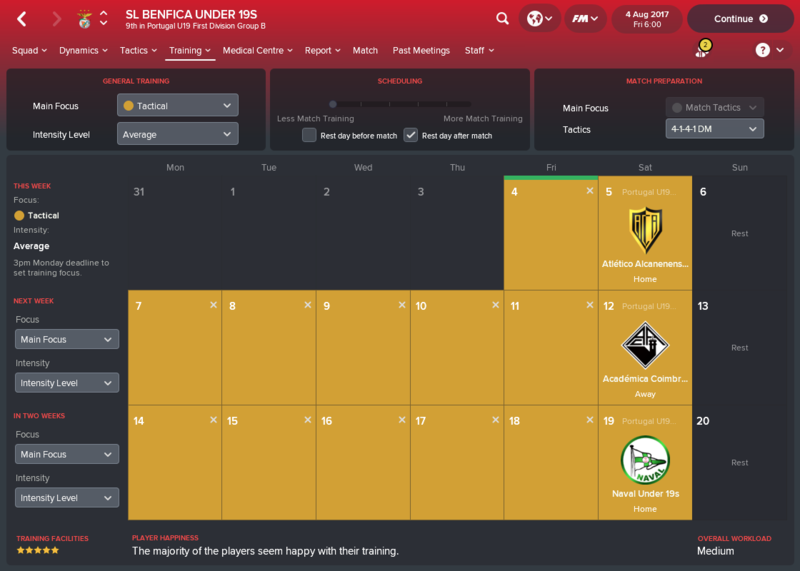 they are benfica academy players after all. i play a simple 442 because it allows me to develop forwards, wingers, midfielders, full backs and center backs in the u19 and B squads. I notice you've got both Retain Possession and Pass into Space on. My understanding was that Retain Possession tells players, in part, not to play through balls, while Pass into Space tells players to play those through balls. But you obviously know what you're doing--so what effect are you achieving by using the two instructions together? Excuse me, missed this one. They may never play as a Complete Forward, but they may play as a Striker - particularly as I don't have many - and this is the widest spread of attribute development whilst training to play in the Striker position. At this moment, I am just keeping potential doors open. Could a mod delete this post please? @Ö-zil to the Arsenal! I just caught up on the possession post. Fantastic once again. I've noticed you never use the 'Play Wider' instruction in your tactics. In reference to your 2-3-4-1 shape (which looks very Pepish! ), would this instruction not spread the wingers even wider, potentially giving your central players more space and your wingers more one-on-one opportunities? I'm thinking along the lines of Cruyff's/Pep's 'keep the pitch as big as possible, and play through the middle' principle. The reason I asked it was because I'd just read a post last night about a retro Man Utd tactic from Class of 95 era. Everyone replying saying, no Giggs is a winger, Scholes is a playmaker and so on. Everyone had a clear idea on what type of players they were. And I thought, yep, if you were the best side domestically you try and play to your player's strengths, proactive not reactive. Maybe this applies to this Benfica team of yours, lets ask the question. Its a good point you raise that there is element of polish applied to the user interface about it, Your examples about an adapted central mid and then specifically Pirlo shine a light on what might be a little bit of window dressing by SI. I'm trying to think about the same thing myself in terms of creating a good possession tactic that is effective. I used the wide men as wingers (s) with hold position and stay wide. 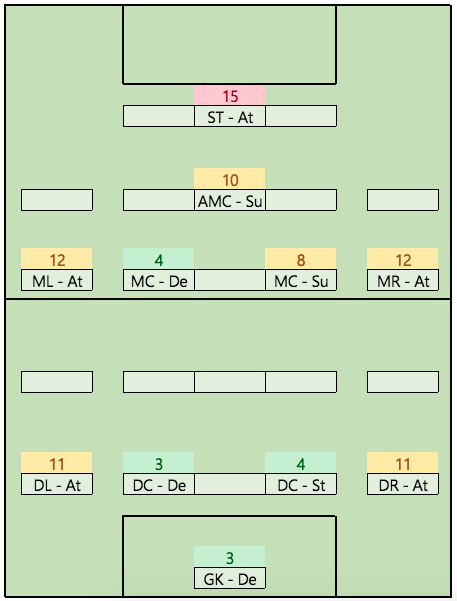 This theoretically mimics Pep's approach in that he prefers the wide men to keep the width to (a) pull the defenders and midfielders wider to create more central space for the central creative players, and, (b) allow inverted full-backs to play inside the wingers occupying more central space, making under-lap runs instead of overlap, as well as being more central to link up with CM's. 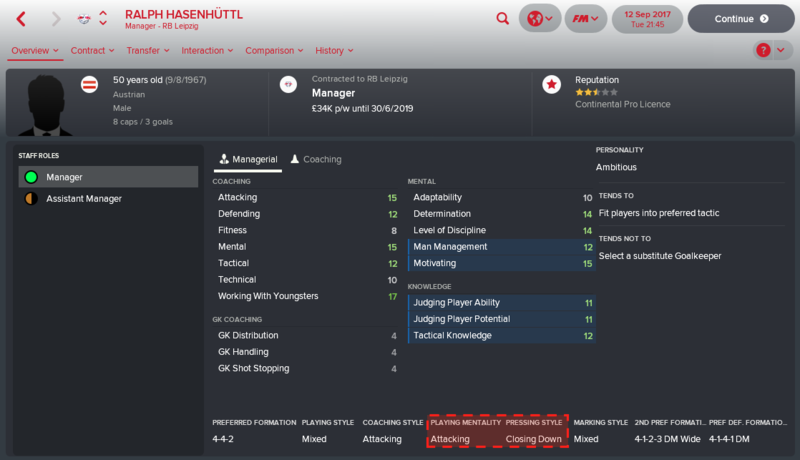 I think you've got the right idea, which is why I believe that possession tactics frustrate a lot of people on FM, because they inevitably face a lot of the same issues that real life possession teams face. 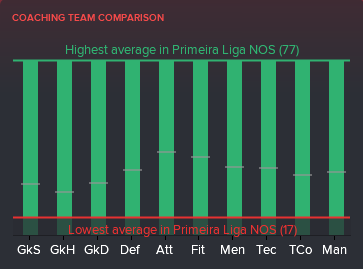 Opposition teams sitting back deep and very few clear opportunities are created (in FM, very few highlights). So, my working idea is to play wider, wingers keep their position wide, inverted fb's inside them to link with cm's and make channel runs between defenders (who are stretched out by wingers prior), have one CM with some dribbling ability to roam and dribble (ala Iniesta) to draw players and create more space, and have a false nine who drops deep to pull defenders with him to draw away that deep opposition defensive block. That's the idea, in theory. I don't want to steal the thread away from you, I'm looking forward to reading the possession posts later today when I get home from work. 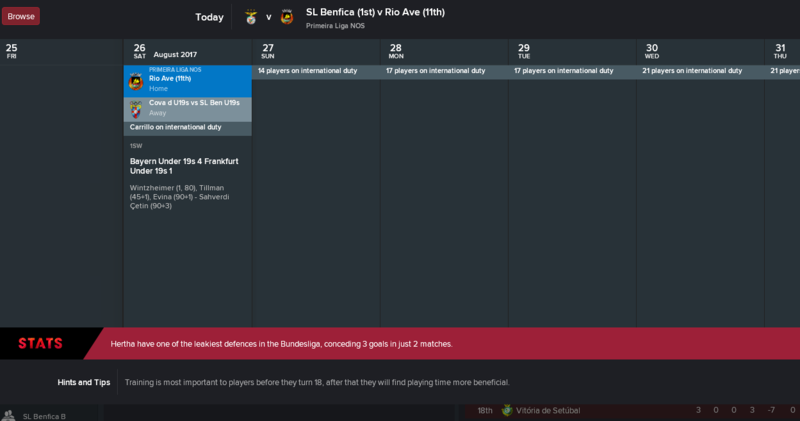 I play 442 and have reached two Champions League semi finals but have struggled when coming up against three in the middle sides. 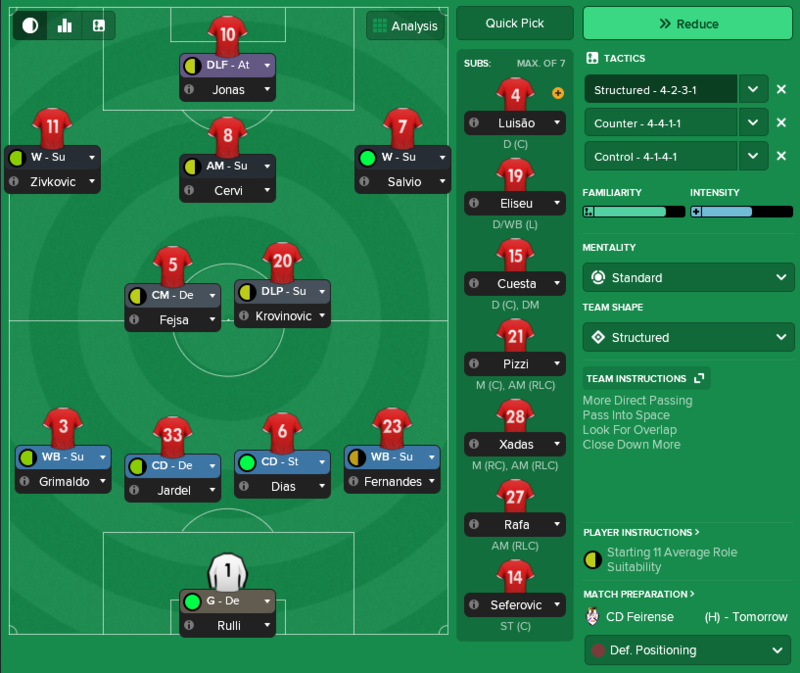 Those two semi final defeats and an 'early' exit in the quarter finals have all come against Arsenal who are simply too good in midfield for me to handle, even if I play Fernandes as an inverted wing back or play Carvalho or Felix as wide playmakers tucking inside. 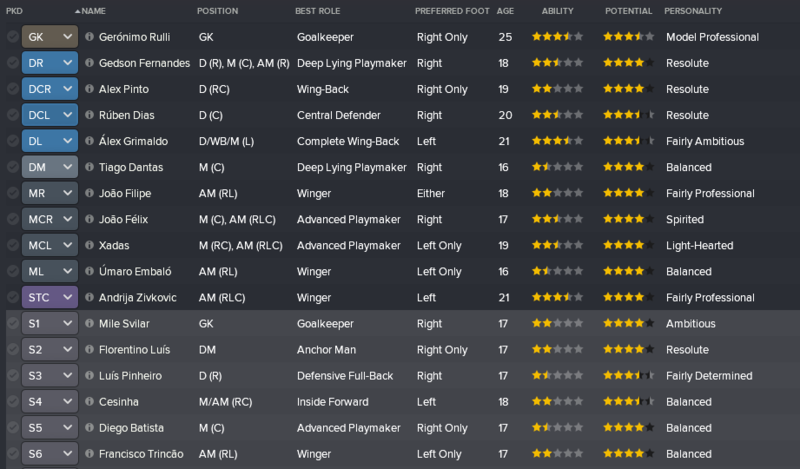 The players with an asterisk are regens who came through our academy. I only bought Sanches, Guedes and Dias. I sold Dias to Manchester City but bought him back three seasons later for the exact same transfer price. Have been thinking about going three at the back with Dias, Alvaro and Pinto. That way I can give Fernandes starting minutes at right wing back. It's not that I consciously don't use it. Watching matches the control mentality and designated wingers have always given us plenty of width so I have simply never seen the need. Thank you. Yes, I suspect that much of it is window dressing. 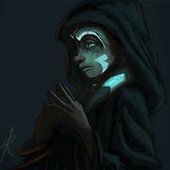 They could be useful for helping AI pick roles or simply for people who enjoy seeing weird and wonderful roles in their tactics. To me, there are a few with practical application - playmakers, half back, inverted wingback, mezzala etc - but many which are simply PI templates. This is certainly no official advice, just based on my experience and observation. Manchester United '99 era is a great example. Giggs is pretty much a winger whichever way you look at it. Scholes and Keane could be interpreted as Central Midfielders with PIs tailored to suit or some combination of playmaker, ball winner and/or box to box midfielder depending what game you're watching. The box to box midfielder is simply a CM(S) + roaming. Apparently there is some further difference but I could not tell you what. My personal opinion would be a box-to-box midfielder IS a Central Midfielder - doesn't apply in reverse - and I dislike the addition of roaming. Don't like the idea of midfielders popping up anywhere whilst we struggle to control the midfield. Sometimes the issue is different interpretations of the attributes required for the role, others it's different interpretations of the role itself. Take a look at a Complete Wingback in comparison to a Wingback for example. That's interesting. It's a similar idea, for sure. Feel free to post your team / set up as it may be an interesting comparison. 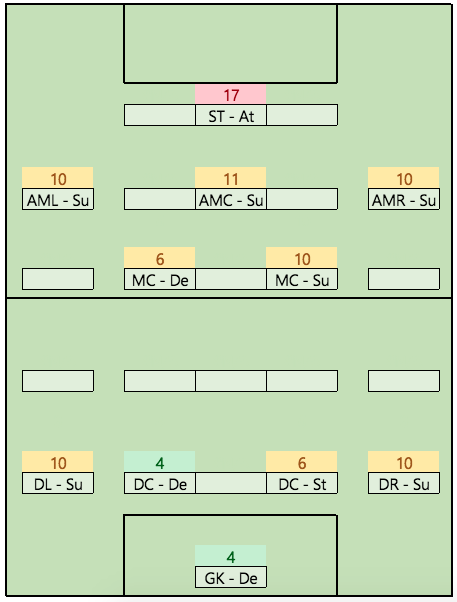 To explain a few choices - my wingers do not hold position as a) I need them forward to occupy fullbacks, b) they get into the box in the final 3rd and contribute quite a few goals. I think this is the video Henry explains Pep asked him to stay wide during buildup but was free to attack in the final 3rd. Finally I chose a Deep-Lying Forward over a False 9 simply for the addition of Hold Up the Ball to link with the midfield 4 swarming behind him. Don't worry at all, these threads are way more interesting as discussions and input from others is always welcome. Our sides are - interestingly - shaping quite differently. 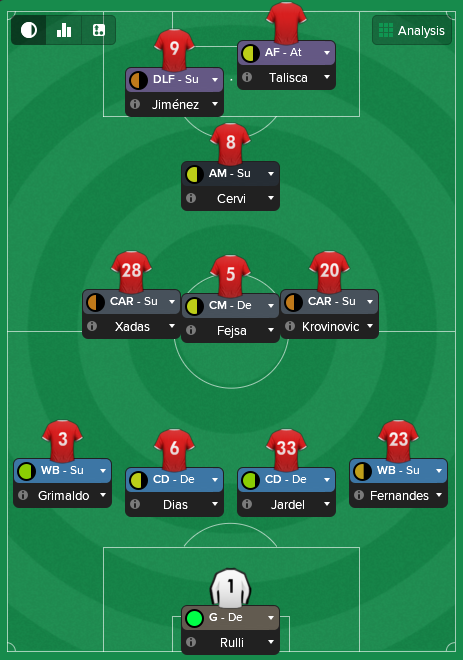 In midfield I am most excited by Dantas, Felipe, Felix, Embalo and - brought in from Braga - Xadas. 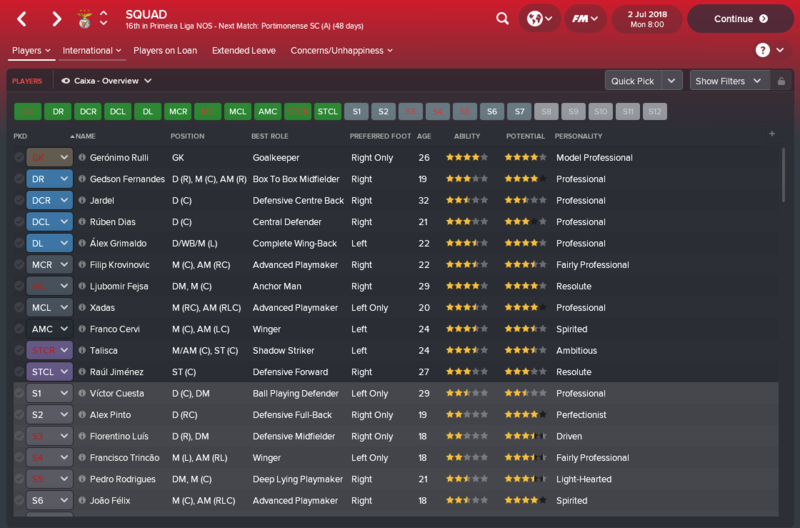 By the second or third season the squad should be capable of playing just about any style and formation you want! 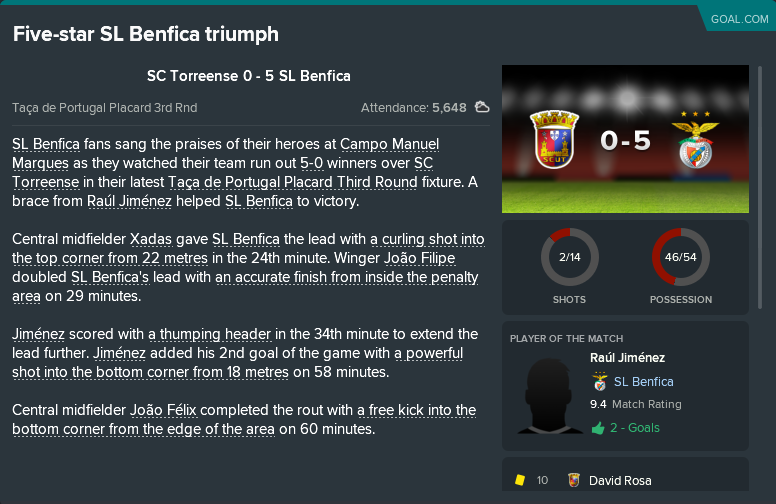 Yes, I mean to type Joao Felipe, he's my winger. 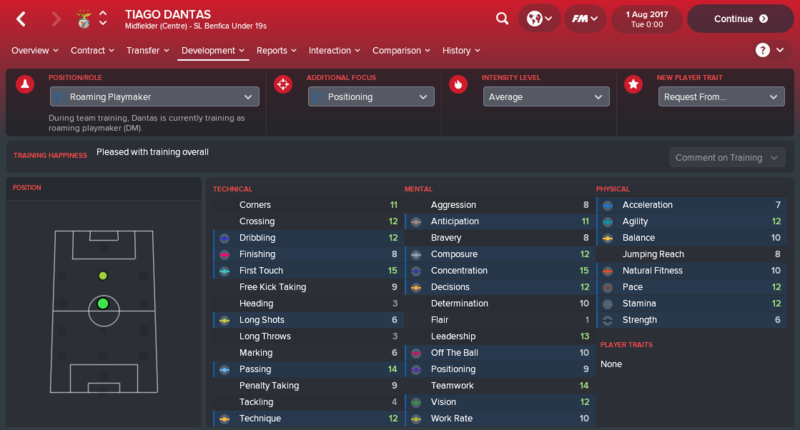 Dantas is probably one of the oldest players in my B team. He's not bad but I have many better options and players like Tiago and Cardoso have come through the academy to far surpass him. Also, he has a determination attribute of 4 and he refused to be tutored when he was still young. 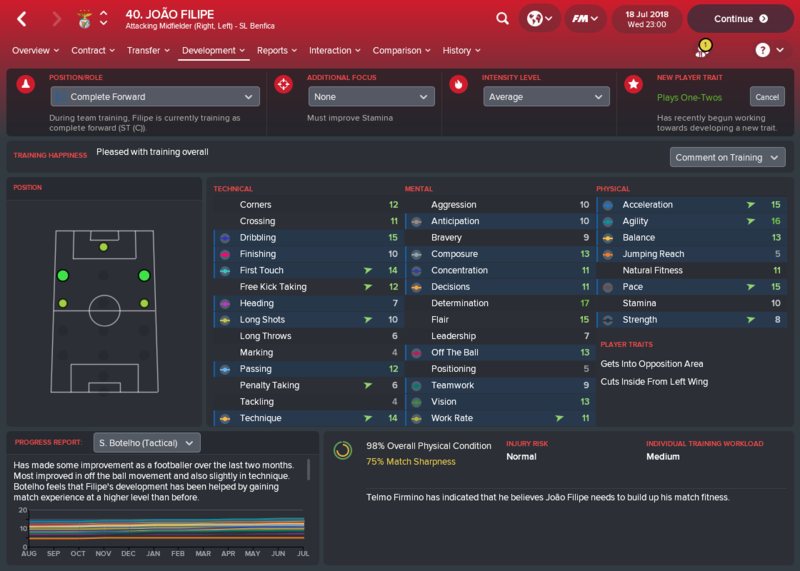 Joao Felix is probably on par with Felipe in my pecking order and has so far notched up 6 goals and 10 assists in the league and we're only in January. However, I like the pace Felipe has and he offers something different down the wing. Both are interchangeable depending on the way I want to approach the following game. Umaro Embalo is probably my biggest regret and/or disappointment. I had high hopes for him and at one time I think he had an acceleration rating of 20. But unfortunately I just couldn't get him to perform and then Chelsea came in with a £25m bid and I had to accept. He's now loaned out to Espanyol from the 31st of January of the current game year so hopefully he'll start to play some decent football. I bought Xadas as well but my preference for club grown talent meant that he found himself on the bench a lot of the time and eventually asked for a transfer. 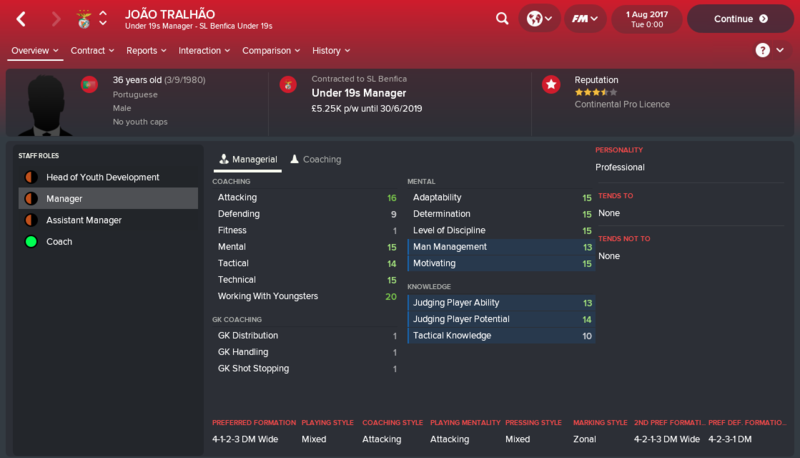 Don't forget to have a look at Joao Carvalho. 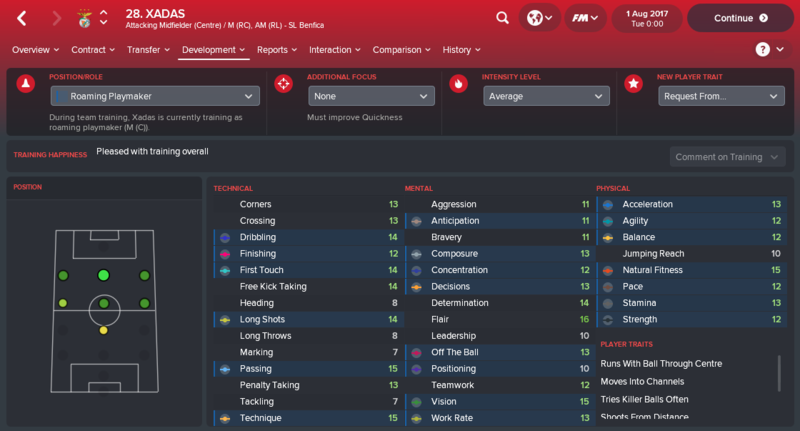 He's a pretty great wide playmaker in my game. I'm a sucker for a two-footed wide player. I think it's so valuable to be able to beat a defender with either foot and then shoot on the inside foot or cross on the outside foot. Interesting you mention Carvalho. 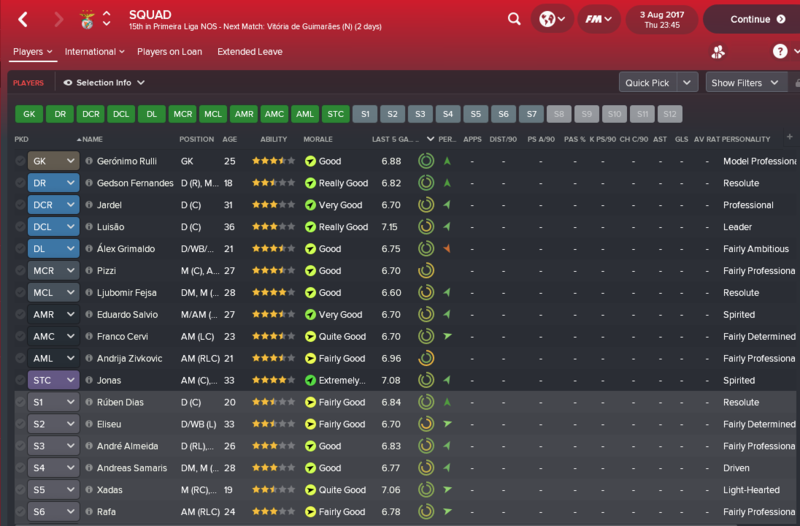 Carvalho, Ze Gomes and Nuno Santos are doing very well for the B Team and Horta and Rodrigues are both performing well on loan. Next season is going to be a headache. Exactly why I decided to sell Embalo. 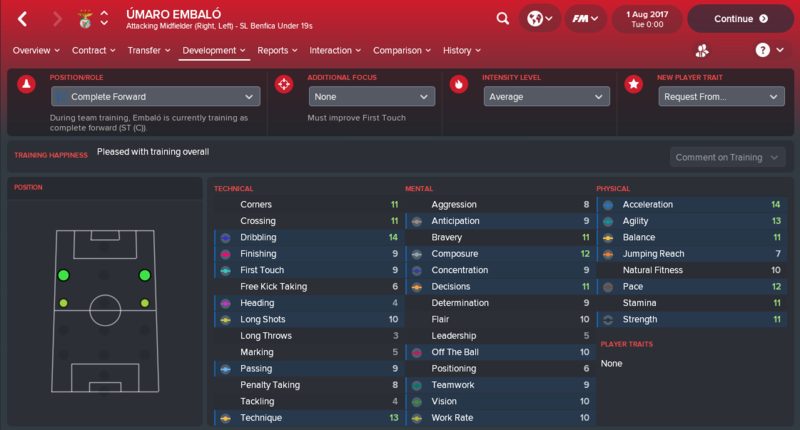 He's very left footed, has a poor off the ball attribute of 11 and has the player preferred moves of 'runs with ball often' and 'runs with ball down the left'. He's extremely one-dimensional and whenever I gave him the nod over Felipe he preformed less. It hurt my left side. Bare in mind he is 16 at the start of the game! Plenty of time to turn him into a more well-rounded player, but yes, left foot only does need work. @Ö-zil to the Arsenal! What if my potential tutor has a good personality but less determination than tutee, you still use him ? Ex. I want to ask Toprak who is Fairly Professional with Det 11 to tutor Zakadou who is Fairly Ambitious with 12 Det. Is it a good idea? Meh. You're not getting much out of that tutoring, unless you're getting some advantageous traits. I enjoyed reading this response. 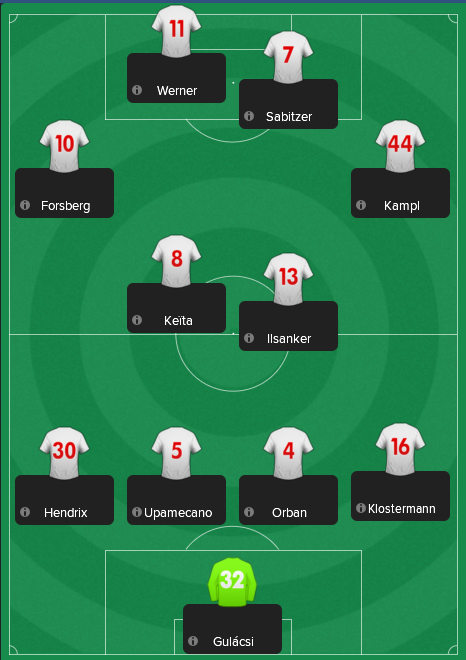 Some of the tactical decisions I've made in my Leverkusen series simply look awful on paper... but the game, like real life, isn't played on paper. We can only guess or assume how all the calculations are made in the ME and sometimes you just try something and it works how you intended, without necessarily making theoretical sense. It means the impact on CA of training a player into a new position isn't always as big as people think. In this instance the impact on your player's CA of improving his Sweeper rating from 1 to 15 would be just 2.